Thank you Melanie for this sensitive contribution from simonstown. The opprobrium of my neighbours is not new to me, because my attitude to homeless people differs from theirs. Erik is tall and humble, with remnants of respectability still clinging to him, or rather, he is clinging to them, because he has fairly clean clothes that are not torn, and decent shoes. He washes my car once a month, a rule which he respects in spite of his desperation. My neighbours are nice people but they don’t have as much self-discipline as he has. One day he waited for me at my door for half an hour or so. They started exchanging messages about how scary he was, waiting there in the shade. I replied that I would be home soon and that they should feel free to go and chat to him; his name was Erik and he would appreciate an apple. Sullen silence. My gardener has not had a better reception. He has been in and out of shelters, but is usually on the street. He is eloquent and active and maintains himself pretty well. Not only does he really know gardening, but he is a handyman too. A neighbour approached me, oozing male authority, to tell me that he didn’t like Michael because he saw him one evening and he was drunk. I replied that he is drunk every evening; that is his tragedy. However, he is never drunk in the morning. I said there is a category of alcoholics who are like that – they remain sober and work well, but when the clock hits the happy hour, they have to have a drink. Neighbour snorted in disbelief, not at what I said, but at me. We are not a gated community and we have no body corporate. The paranoia erupted. We were going to have a Crossroads of criminals on our doorstep. Anger that the police told them to call Law Enforcement – weren’t they the same thing? Anger that they couldn’t be locked up, spirited away. Someone else definitely had to get them into a shelter. The vitriol about the tall man in the cap was mind-blowing. I dared to post that we should not lose our humanity through all of this. 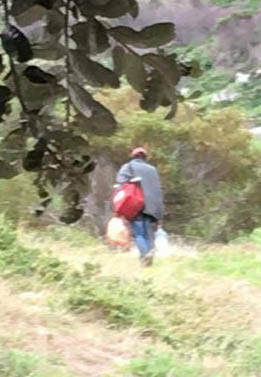 I was told to pay for them to go back to the Eastern Cape “if you want to be perceived as being liberal.” Because I had taken them two black bags to help them dispose of their litter, I was told I was starting a squatter camp. It’s not that I don’t see the potential difficulties, but as long as the City fails to provide social housing and many more shelters I don’t see that we can prevent informal settlements from springing up, and there must be better ways of dealing with the people in them, who after all are also our neighbours. The situation is unresolved. They are still there, maybe five people who hang their blankets out on bushes to dry in the morning. This is in spite of the three occasions when Law Enforcement arrived and told them to move. They arrived in about 6 vehicles with flashing blue lights and they arranged for the site to be cleared. My neighbours are disgusted that Law Enforcement has to try to get their families to take them back and consult with social workers about their fate. They watch me like hawks and strictly forbade the one woman of colour who lives there to give them any food. I now give donations and food to the shelters.